The hockey drought is over! Sunday, the Vegas Golden Knights are up against the Arizona Coyotes for the preseason opener at T-Mobile Arena. 13 Action News spoke with fans excited to kick off the season with brand new gear at The Arsenal. 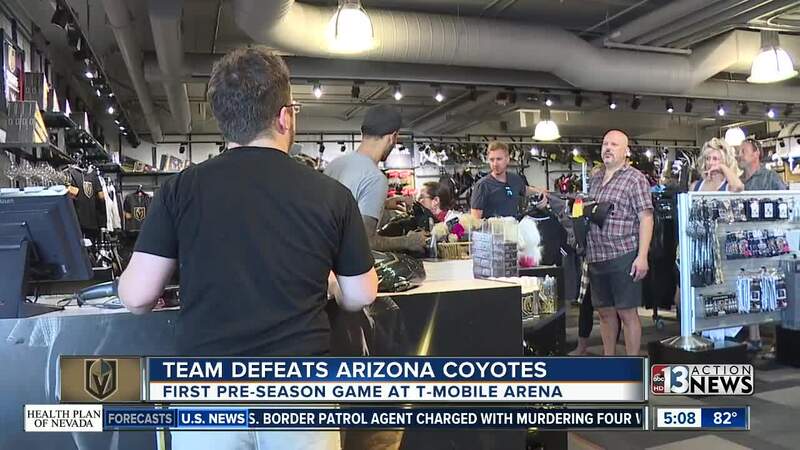 Golden Knights fans, old and new, lined up to buy new merchandise for the highly anticipated preseason game. Betty Smith says, "I may get one of those super nice jerseys. I want something really cool to wear tonight." Laura Dudinsky says, "I have hockey pucks, hockey sticks, I had it taken away from me during the playoffs because I almost broke the TV with it but that's okay." For the first time in three months, the Knights are hitting the ice. During their break, the team lost and gained some players. David Perron and James Neal left as the team added new and big names to the roster. All eyes will be on Max Pacioretty tonight --- former captain of the Montreal Canadiens and star forward. Adam Malan says, "You know it will be interesting to see. I think we got better." Defenseman Nate Schmidt remains suspended for the first 20 games of the season for violating the NHL's performance enhancing drug policy. Knights fan, Megan Platt, says, "It doesn't take away from anything that they're doing." At the end of the day, fans are just excited to see the Knights back in action. "Whether they win. Whether they lose, at this point I don't think it matters. It brings us all together," says Dudinsky.